CHIEF Chipepo of the Tonga people of Southern Province has urged opposition political parties to accord President Edgar Lungu the respect he deserves. He condemned what he called “insulting statements” directed at President Lungu by some opposition party leaders. In an interview with the Daily Nation, the traditional leader said Zambian politicians should learn to practice politics of maturity, saying that there were a lot of issues the opposition could talk about in their campaigns other than insulting the Head of State. He indicated that all those who were insulting the President were insulting Zambians because they were the ones who put him in that position. “Politicians must learn to be mature; there are a lot of issues that politicians should be talking about, not always insulting the Head of State. Insults are not part of politics, you don’t have to insult when you are campaigning. “President Lungu has got two positions right now, one he’s a president of a party and at the same time he’s a State President. The Bible is very clear in Romans 13vs1-6, it states that respect those in authority, when you insult a Republican President, you insult Zambians. In America, when you insult a head of state even those who don’t want him they can deal with you,” Chief Chipepo said. He stated that respect for the office of the President in any country was not a matter of choice but a civic obligation that must be respected. “Such inciting statements on the Head of State are worrying; being an opposition party or critic is no license to issue abusive, intemperate and slanderous statements on the President, it’s not just right,” he said. He appealed to opposition politicians to be mindful of what statement they issued on other leaders, reiterating that leaders were chosen by God. Chief Chipepo said those insulting the Head of State as a campaign strategy were just deceiving themselves as Zambians could not be moved by insults. “The Bible says do not curse a leader of the people; so now President Lungu is at the moment the leader of Zambia. There is nobody else who is Republican President apart from him. 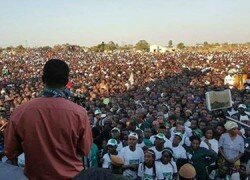 All those who are insulting him are just campaigning against themselves, because Zambians are very mature now and they hate insults. “They should always remember that as they are aspiring for an office, when they insult people in leadership, when they come into office, people will insult them, it will back-fire,” Chief Chipepo said.